Democrats oppose TABOR because it prevents them from spending as much of your money as they want. Let’s apply ten conservative political principles to this hospital provider fee situation. 1. Limiting growth of state government requires setting state spending priorities. 2. Allowing any business to fail that has insufficient market demand is called the free market. Government intervention violates the meaning of a free market. 3. What does the most good for the most people–propping up failing businesses or providing broad benefits of limited government services equally to everyone? The big issue: would it be an end run around TABOR or not? Does it lower the base or not? Dire funding news for the state’s hospitals has left Republicans in rural Colorado pleading with the legislature to restructure the Hospital Provider Fee, despite ideological beliefs. It is a thorny issue that pits conservatives in the legislature against fellow Republicans in rural parts of the state. Hospitals face a $264 million reduction in the upcoming budget that begins in July. That number is up from an initial budget request in November, which proposed a $195-million reduction. Rural hospitals are expected to receive the worst of it, with expectations for some hospitals to close. Budget writers have proposed a $28.3 billion annual spending plan that lawmakers will begin to debate this week. In an effort to pass a balanced budget, the Joint Budget Committee proposed reducing collections of the Hospital Provider Fee. In 2005, Referendum C suspended Colorado’s constitutional limit on the amount of tax revenues that the state could keep. Called the “TABOR timeout,” the Referendum allowed the state to reset the limit on state revenue collection at the highest amount of annual revenue received between June FY 2005-6 and FY 2009-10. Referendum C was a permanent tax increase, which has increased Colorado state spending by an estimated $2.6 billion over the last decade. At present, only 38 percent of state spending remains subject to TABOR. Peter Strescino’s TABOR article in The Chieftain of March 1 was balanced and informative. But what is the purpose of the paragraph saying that ?“TABOR was passed in 1992 on its third try by Colorado tax rebel Doug Bruce” who has owned “run-down Pueblo properties in the past”? Is it to show that in 1990 and 1991, legislators told voters, “Hey trust us; you voters don’t need TABOR to protect yourselves from tax increases,” and that voters believed twice — but not three times? Is it to show that Bruce passed TABOR by himself, as the writing implies or to show that thousands of voters did indeed rebel against … legislators and vote for themselves some participation when their taxes are being raised? Is it to show that Bruce is really a Pueblo guy at heart because he, too, has owned run-down property in Pueblo, a city with a website dedicated to run-down property, a city with a newspaper that rightly criticizes run-down property, but a city with a municipal government that can’t seem to protect its citizens from the scourge of run-down property, and that such a state of affairs could lead taxpayers to rebel and to deny tax increases? Is it to show that if you get lucky, the guy owning run-down property on your street might save his fellow citizens $3 billion? Which brings us to the editorial in the same issue of The Chieftain. The editorial complains that the city government wants more money, but they don’t want to ask for it, as the law requires; they want to simply take it by calling a tax a fee. I hope The Chieftain appreciates the irony. It is this disassembling by elected officials that is causing this discussion to occur and voters to rebel, but without the voter rebellion and approval of the TABOR law, your editorial would be a blank page — no discussion of taxes or of fees. Now comes the good part: Thank you to The Chieftain for covering these issues in a professional manner. Without newspapers going to the uncountable government meetings, how would the citizens be able to learn of the actions of the government? We can’t all go personally to these meetings, and heaven forbid the day that we might be at the mercy of some blotter in his basement to learn about the government. Reading through the mailing I received that was also sent out to all registered voters referring to Measure 1A it becomes very obvious the City believes it desperately needs additional funding which will be the outcome if 1A passes. I am in agreement that it probably is necessary providing the information presented to the public in this “Notice of Election” and along with the mailing that accompanied this month’s utility billing is in fact correct. I do find myself somewhat troubled over several issues, I have yet to see a commitment from the city that during these times of economic struggle they assure the public their business will be run as efficiently as possible and they will focus on conducting business off of a priority list rather than the wish list. Following eight months of negotiations, the Colorado Legislature’s leaders late Wednesday introduced a 20-year transportation-funding bill asking voters to approve a sales tax hike to generate some $677 million per year for highway and transit projects — without making significant cuts to existing state revenues. Observers, including Gov. John Hickenlooper, quickly referred to House Bill 1242 as a starting point, saying they expect details about everything from the size of the tax hike, to the allocation of new revenues, to be up for debate in the two months that the Legislature has left in its 2017 session. 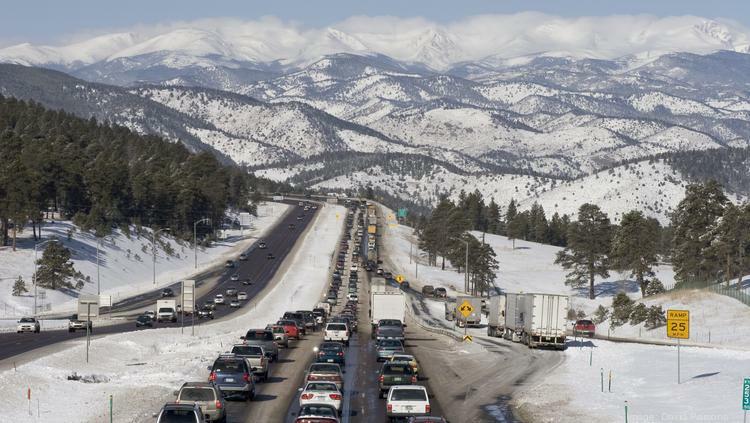 A traffic backup on westbound Interstate 70 heading into the Rocky Mountains. But House Speaker Crisanta Duran, D-Denver, and state Senate President Kevin Grantham, R-Cañon City, both expressed gratitude at finding a compromise they believe can muster support of their two parties’ lawmakers before they take their case to voters. “We want to make sure that roads and bridges and transportation options across the state are adequately funded for generations to come,” Duran said shortly after introducing the bill just past 5 p.m. Wednesday. She will co-sponsor HB 1242 in the House along with state Rep. Diane Mitsch Bush, the Steamboat Springs Democrat who chairs the House Transportation and Energy Committee, which will hear the proposal first.